At the suggestion of Physical Education teacher Julie Moor, Warrnambool College entered a team of five riders and two supporters who took up the challenge of riding the 520 kms for the 1990 Murray to Moyne. In this year's relay the College will have a team of up to 14 riders and 4 supporters. Tragically Julie was killed during a training ride in February 1991 and we ride to remember her spirit and love of physical effort and the outdoors. Over the 28 year life of Team 12 it has been made up of current and past staff family members and friends and there have been 45 different riders who have been ably assisted by 15 different supporters. Six of the 2017 Team have participated in more than 18 relays whilst 9 have completed over 400 kms for the weekend, 4 having completed the whole distance. The longevity of the team would not have been possible without the interest and enthusiasm shown by our riders and the efforts of our supporters who have accumulated over 90 participations. The ongoing support provided by the Warrnambool College, South West Health Care and Warrnambool Cheese and Butter has been invaluable. The financial assistance and in-kind support provided by local businesses over the years has been much appreciated. The energy and effort of team members to sell raffle tickets and produce, and assist in all other fundraising projects has been commendable. Further praise should be given to those in the team who donate both financially and in-kind. Our team raises funds for the Children's Ward at Warrnambool Base Hospital (South West Health Care). Monies raised have been used by WBH for ward refurbishments, furniture, computer and television equipment, fund patient programs and to buy much needed medical equipment. 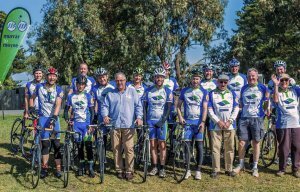 Like all teams, the varied weather conditions - cold south westerly and hot northerly winds, blistering sunshine, fog, frost between Horsham and Hamilton - have added to the challenge of the ride. There have been accidents explained and unexplained, but no bones have been broken. Given the accumulated distance we have covered over 27 years few punctures have been had. As time went on we have become more sophisticated; using more than one vehicle and 2 way radio; team colours have changed several times and team size has averaged out at 11+ per relay. Graham Woodrup's original aim was to encourage riders to take up the challenge and our continuing participation and preparation have fulfilled his legacy. The efforts, achievements and friendships made over the past 27 years are important and we know that our endeavours to make a difference have been appreciated. As we prepare for the 2017 Relay and may it long continue.